A fine large old Northwest Coast Tsimshian Indian hand carved cedar totem pole dating circa 1940-50's. 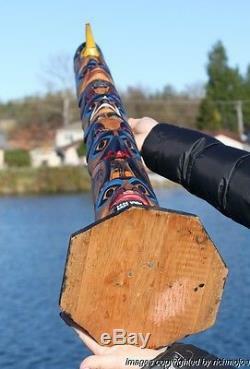 The totem is large and very impressive with highly detailed well carved imagery depicting Eagle, human , frog, bear , raven bear with Halibut crest imagery. Note the fine detailing, excellent painting and the deep hollowed out back. The totem stands an impressive 38 1/2"tall with a base measuring 7 1/2" x 7 1/3 and is in very good condition with no repairs or damages noted. The totem makes an impressive display item and a fine addition to anyone's collection. Get FREE counters from Vendio today! The item "FINE LARGE OLD NORTHWEST COAST TSIMSHIAN INDIAN HOLLOW BACK CEDAR TOTEM POLE" is in sale since Monday, February 01, 2016.